Ritter Forest Products understands how challenging it can be for companies to keep their job sites as safe as possible. It’s why we strive to make things easier on them by providing hardwood crane mat sales and rentals in Sulphur LA. Our crane and timber mats rentals are specifically designed to help those in the construction and drilling industries with keeping their heavy-duty equipment safe. We sell and rent an excellent lineup of products, including pipeline skids that will help you stabilize this equipment. At Ritter Forest Products, we currently carry thousands of crane mats and can deliver as many as you need today. We also can help you design a custom mat and timbers for your job site. From choosing which kind of hardwood to use to build it to coming up with the right size, we can show you how to customize every aspect of a crane mat in Sulphur LA. When you place a crane or another piece of heavy machinery on a crane mat, you will be adding an extra layer of protection between the equipment and the ground. This will prevent it from sliding around when you use it and stop it from sinking into the ground. Crane mats in Sulphur LA are excellent tools for keeping equipment safer and allowing you to use it without encountering problems. 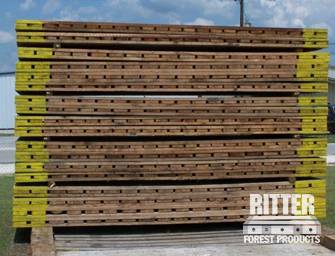 The crane and timber mats rentals available through Ritter Forest Products are all made using high-grade materials that won’t break down on you. Our timber mats in Sulphur LA are known to be durable and able to stand up to whatever you throw at them throughout the course of a project. 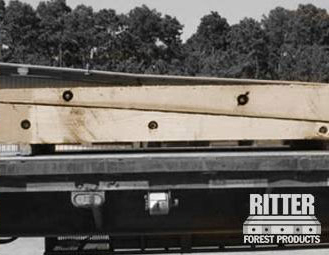 Although laminated mats in Sulphur LA from Ritter Forest Products are more lightweight than traditional crane mats, you shouldn’t take that to mean that they can’t tackle any challenge. Our laminated and timber mats for rent are designed to be strong and sturdy. They can be used to build temporary roads and stable platforms and can also be moved around more easily than other mats can. The 3-ply laminated mats from Ritter Forest Products are built using 2x8s and the same materials as our other crane mats. But they are lighter and more maneuverable, which will make it more convenient to use them in some instances. You can pair them with chains and cables to use them for lifting purposes or keep them on the ground for lighter load demands. Does the equipment you’re using need more support than the average crane mat can give it? Outrigging pads can be custom made to keep your equipment even more stable than it already is. 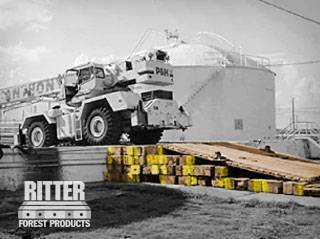 Ritter Forest Products also carries transition pads in Sulphur LA that are meant to make it easy to take equipment from the ground level up onto any elevated platform. When you use these pads and mats with our hardwood crane mat sales and rentals, your equipment won’t go anywhere unless you want it to. When you’re in the process of building a pipeline, it’s important to focus on cribbing, racking, and elevating your pipes as efficiently as you can. The pipeline skids/timbers in Sulphur LA from Ritter Forest Products make this possible. You will be able to put your pipeline together quickly with these products. Anytime you put up a temporary wall or structure, you should reinforce it to make sure it doesn’t fall over. 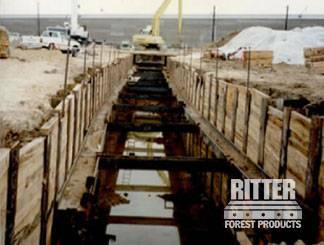 Ritter Forest Products has Sulphur LA Shoring material/cribbing to take care of this aspect of the job. Our shoring and cribbing materials are strong enough to provide support for almost any structure and can even hold up your equipment if you need it to. Hardwood timber products can be hard to come by in Sulphur LA, but Ritter Forest Products has plenty of them available at the moment. Let us help you with hardwood crane mat sales and rentals by giving us a call today.